Industrial Steel Partitions are easily overlooked as solutions to your office needs. They provide a tough yet flexible way of dividing your workplace as an alternative to more traditional stud and board or block-built partitioning systems. Just as modern building techniques trend towards pre-fabricated buildings, the industrial steel partition sections are created, and painted to the colour of your choice, in a factory. They arrive ready-made and are simply bolted to existing wall panels on site. No wet trades, no plasterboard dust and no decorators – it’s simple, quick and easy. You’ll hardly know anyone’s been, well other than the fact you now have new great looking offices made from our steel partitions ready to use. Our industrial steel partition systems can be wiped down, are dust free and can form the basis of cleanroom construction environments. They are also available as single skin or double skin steel partitioning. • More options – half glazed, fully glazed, double glazed, wire glass, toughened glass and pyroc glass options are all available with steel partitions. Industrial Steel Partitioning is incredibly versatile and can have many uses. It can be used for creating dividing walls, preventing an enclosed area from intrusion, offices enclosures, where appearance strength and insulation are required and other dynamic working environments. 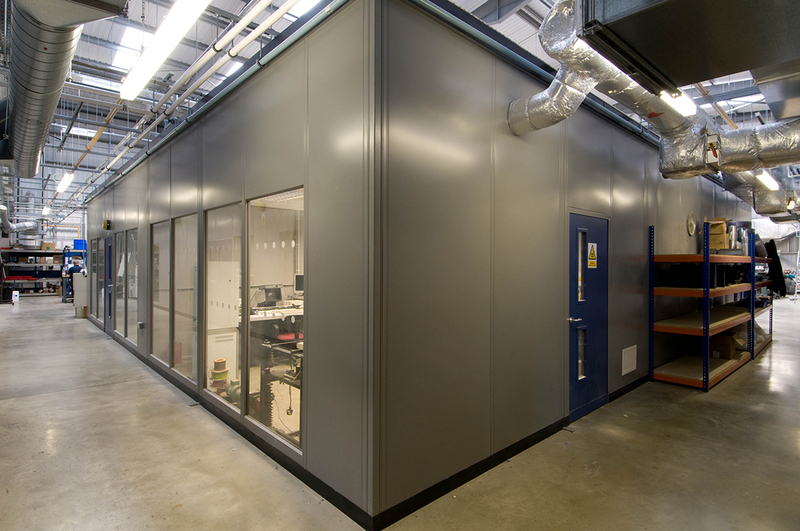 Why not consider a double-skin steel partition which offers a versatile attractive appearance for the working environment and is ideal for food areas and cleanrooms.